This should come as no surprise to those of you who have gone to the Dripping Springs Farmers Market, but it was recently dubbed the best in Texas. That’s right! Not just the best local farmers market, but the best in TEXAS! Here’s some more info on this exceptional recognition for this delightful local event near Caliterra. But wait, it gets even better! Along with being named the best in Texas, the Dripping Springs Farmers Market was also ranked as the 7th best in the nation, and we look forward to seeing it surpass the other top 6 in the years to come. What Laurel Robertson, the Farmers Market Manager, says that sets the Dripping Springs Farmers Market apart from everyone else is the uniqueness of the products sold. Businesses at the Dripping Springs Farmers Market have to make or raise their products themselves, which means that all members of the market are the primary producers of what they sell. If you haven’t come to experience the Dripping Springs Farmers Market for yourself, you’re really missing out! The best farmers market in Texas takes place every Wednesday, rain or shine, at “The Triangle” on the corner of RR12 and U.S. 290 from 3:00 PM – 6:00 PM. 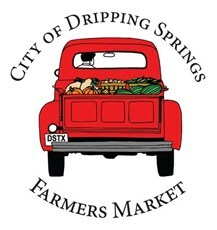 We absolutely love having this amazing market near our master-planned community in Dripping Springs, and we’d love to know what your favorite thing is about the Dripping Springs Farmers Market. Let us know by connecting with Caliterra on Facebook, Instagram and Twitter.